Baxter Building Ep. 15: "Follow Plan 'T For Taunt'!" - Wait, What? Previously on Baxter Building: Just when all seemed lost, Archie Goodwin saved the day by stepping in as guest-writer on the series in mid-storyline and demonstrated that there was life in the Fantastic Four yet — mostly by turning Reed Richards into a temporary threat and bringing Doctor Doom back to be awesome. But with Stan Lee’s return just around the corner, can the quality level remain this high? 0:00:00-0:06:59: To begin the episode, a cold open that actually comes from our post-show conversation about where we first read these comics — Marvel UK reprint talk, ahoy! The book I talk about is this one, for those curious — and the idea of “jumping-on points” for new readers. 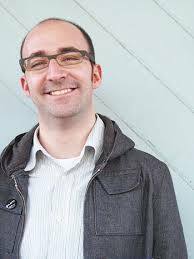 Includes special meta-moment where Jeff suggests we make it the cold open! 0:07:00-0:08:42: The very little introductory to-do lets you know that we’re going through Fantastic Four #119-126 this time around, except that’s very much a lie — we only get through #125, because get caught up in the first issue far more than either of us expected. Sorry, those who hoped we’d get into the first issue of Roy Thomas’ run. 0:08:43-0:30:05: And talking of Roy Thomas, Fantastic Four #119 is, I say, “the ultimate preachiest Stan Lee comic that just happens to not be written by Stan Lee.” Yes, Thomas guest-writes this one-off in which the Fantastic Four solve racism, and it’s amazing. Not necessarily in a good way, but, man. But there’s so much more to it than just dealing with 1972 international race relations: Johnny Storm’s weird science! AUNTIE, the robot that demonstrates that Roy Thomas doesn’t really understand how acronyms work! Other things that Roy Thomas doesn’t really understand how they work (Like the idea of “blood brothers”)! The self-obsessed melodrama of Reed Richards! The unusual prevalence of skyjackings in the 1970s! 0:30:06-0:55:58: As the Thing and the Human Torch arrive in Fictional Racist Country 1972AD, Jeff compares the way in which the story tries to come to terms with racism with a letter in the same issue from a reader who suggests that the Thing would be the ideal character to deal with such issues — let’s just leave it as “perhaps they had the best of intentions, but the reality didn’t necessarily live up to them.” Oh, and we get to meet the Black Leopard, because T’Challa’s changed his name in this issue because of a combination of not wanting to upset White America and, as Jeff puts it, “one of Roy Thomas’s ‘Uh, you know, scientifically…! '” Yes, this really is a strangely cautious comic for one that’s trying to make a political stance. But at least there’s a villain called Jeth Robards and an appearance by Klaw, even though Jeff and I both forgot the last quarter of the comic exists. Blame a lot of that on the efforts of Buscema, who manages to make a three-page fight sequence underwhelming, and we have a brief discussion about what’s missing compared with Kirby. 0:55:59-1:15:12: FF #120 begins what Jeff calls “yet another swan song for Stan Lee,” as “The Man” returns for six issues to utterly sully his legacy on the title. If you’ve ever thought to yourself, “I wish that rumor about Jack Kirby doing Galactus as God was true,” then get ready to meet Gabriel — the all-powerful threat who’ll make you wish you had read the Bible more closely! But before we get to him, we have to grapple with men with pillow cases storming the Baxter Building, and the question of whether or not the Fantastic Four needs its own J. Jonah Jameson (It doesn’t). 1:15:13-1:32:32: If your favorite part of the Overmind arc was that the world turned against the FF, get ready: it’s back in Fantastic Four #121 because an angel told them to do it. What’s that, you say? Why would an angel come to Earth to tell people to beat up the Fantastic Four? Oh, that’s just one of the logic problems in this astonishingly underwhelming, disappointing issue that undersells its own highlights in its desire to fit a particular format. 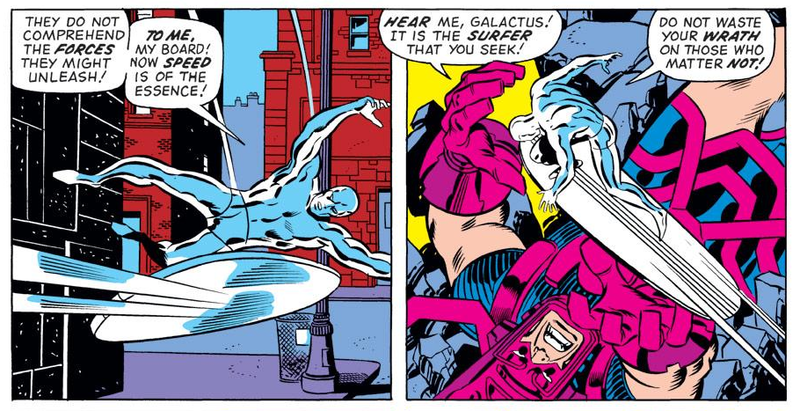 But don’t worry — there’s the additional star power of the Silver Surfer and Galactus to try and distract you from the many problems on show here. Spoiler: it doesn’t work. This is what happens when Stan Lee tries to outdo a rumor about his earlier stuff. 1:32:33-1:42:49: Buscema’s layouts in FF #122 bring us back to conversations about the nine and six panel grids and why they don’t work as well as, say, Kirby’s 6-panel pages or Dave Gibbons’ 9-panel pages on Watchmen. It’s arguably the most interesting thing about the issue, because the rest of the issue relies on an idea that manages to make both Galactus and Reed Richards seem smaller and less capable and awesome (in the old-fashioned sense of the term): that Galactus can be easily distracted by someone stealing his spaceship. 2:09:05-end: Next time: A New Beginning, apparently, as we take on the brief entirety of Roy Thomas’ (first) run on the series and find out what happens when the series tries to go back to basics. Until then, we’re available on Twitter, Tumblr and Patreon, to tide you over with… good tidings…? Okay, maybe not so much. But there will be a regular Wait, What? next week right here to make your week start right…! As always, thanks for listening, and reading through the show notes. I loved the Complete Fantastic Four – a full new story at the front, a reprint of the first stories at the back. Wow! That bound-together comic sounds fun but in the late Sixties/early Seventies there was an even better catch-all title – Double Double comics. So that was four issues of random comic books bound together with delightful miscoloured covers, sometimes from a comic that wasn’t in there. They were mostly DC but occasionally a Marvel would get in there, I first came across the Avenges in one, a Super-Adaptoid story. Anyway, the excellent Lew Stringer has written about them here – I still have the one he show with the Adventure Comics cover. And I’d better get back to the show. Only at the theme music… I’m torn, I like the chat but find cold opens a bit disturbing. I don’t get why you feel you have to have one, I’d prefer whatever to be a simple digression, where it comes up, or at the end. It’s like US TV, I can’t relax into a show cos I’m waiting 19 minutes (literally, once, in the case of Alias) for the credits to come on. Ah well! My favourite in-joke regarding Richard Nixon and his frequent appearances in late 60’s and early 70’s Marvel is over at http://www.supermegamonkey.net/chronocomic/ (a website that attempts to create a chronological reading order for every issue of Marvel comics ever and exceedingly useful to me as a reference tool for the following paragraph) where he is tagged for search as Secret Empire Agent Number One. After reading Sean Howes Marvel, the Untold Story, is it possible to read the Roy Thomas run on the FF without referencing his disintegrating personal life? Indeed, are all of Marvel’s relationships from 1968 to 1974 a reflection of his relationship with Jean Thomas? There’s a startling amount of attractive blondes entering relationships with the Marvel heroes at the start of that period, and an equally startling amount ending their relationships around the end of that time. Gwen Stacy and Sharon Carter end up killed; Marianne Rodgers in a lunatic asylum; Crystal leaves Johnny for Quicksilver; even non blonde Black Widow ends up splitting from Matt Murdoch. And the centre point is Sue Storm and her separation from Reed starting in the next batch of FF’s you’ll be addressing. Although I imagine, rather like the anti-apartheid story you mentioned above, the ideas may be better than the realisation. When preparing the Marvel Atlas entry for Rudyarda I requested one of the “European” & “Coloreds” panels from #119 as the entry’s main image. Production didn’t like it because they thought it was racist. Which was, yeah, true and the best possible single image representation of what the country was like; every single Rudyarda story over the years has been about what a terrible racist nation they are. So they went ahead… and cropped the two words out of the image. That is an *amazing* story, Michael. Such a bummer. The more important takeaway: Rudyarda reappears at some point?!? You’ve already done the Avengers read-through! Remember issue #126? By Englehart himself! I’ve been waiting for one of you to namedrop Darkoth. And I still didn’t get his name right. It’s the thought that counts, Graeme. Walter Collins: the Sherriff J.W. Pepper of the Fantastic Four mythos. Excellent deep cut and comparison! Is there a reason why this episode is not up on iTunes? That’s my preferred method of listening. Thanks for pointing it out, Rob! I have to say, I have no idea why it’s not up there. I’ll look into it when I can, but I honestly have no idea why it’s not up there. Just checked and it’s up there now, Rob. Absolutely no idea what went wrong or what I did to fix it (I changed the date on it, which wasn’t wrong in the first place?). But it’s fixed. Regarding the “rumor” that John Buscema did not like drawing superhero comics: I heard it from his own mouth at a convention in 1979 to audible gasps from the audience. He wasn’t shy about it either. He did admit he liked drawing Conan comics though. Is it much of a surprise that Lee and Buscema’s FF with the Silver Surfer wasn’t so great? I mean, they had plenty of experience with the character after working together for what, 18 largely dreary, ponderous, self-important and whinney (some of them oversize!) issues. Buscema was a better than average draftsman and decent storyteller but I don’t think I was ever moved by one of his comics. I’d take Romita, Kane or Colan (from that era) over Big John any old day. And regarding Stan’s final days as a full time comic book writer. His work on FF may have been blah, but his last half dozen on Spider-man (most likely largely conceived & plotted by first Kane and then Romita) were perfectly fine. It even included Romita’s favorite Spidey story #108 and 109 – the Flash Thompson/Viet Nam/Dr. Strange two-parter (which he himself inked-a rarity). But then, Lee and Romita had been a generally smooth running machine on the best selling and well regarded title for a half dozen years by then. The difference (for me) between Romita and Buscema was that Romita usually read like he was enjoying himself and Buscema was just doing a job. Another very enjoyable episode. I felt enriched by your discussion on Buscema’s composition. Oddly, that close up of Reed’s eye comes out looking Ditkoesque to me. Just an odd coincidence, or some version of pareidolia on my part I’m sure. 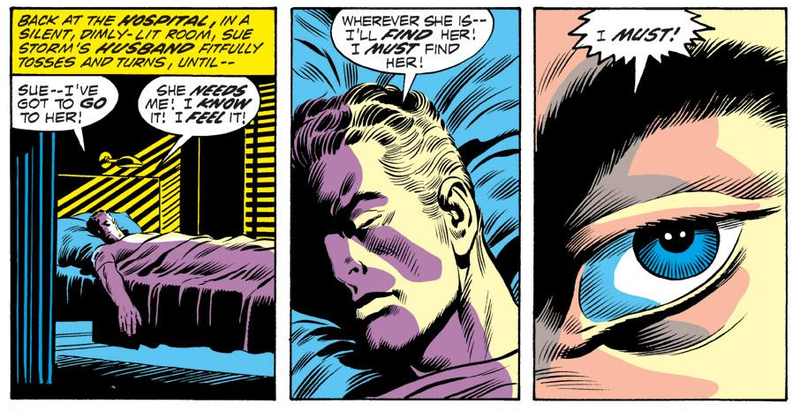 It certainly doesn’t look like Buscema’s feeling it in these issues. Thar first panel of p4 #122 is poor, especially when you factor in he’s being inked by Joe Sinnott! Still there are nice bits, like the last panel of p19, where he gives himself room to draw. My favourite period of Buscema art was of his first run on the Avengers, he used less panels and seemed to draw bigger. It’d be interesting to know if he was one of the Marvel artists whose work suffered from the reduction from x2 up to 1.5x updrawing size. I always took Rudyardia as a reference /analog for Rhodesia, rather than South Africa. Begins with ‘R’ , ends in ‘ia’, taken from name of an eminent Victorian. Picky, pick-pick, I know.